When I am coming up with a menu for entertaining mixed company, e.g. kids and adults or carnivores and vegans, I steer most often towards Mexican food. It is always a crowd pleaser, easy to prepare and I can very often employ a topping bar of sorts. It is no surprise to me that my Mexican-themed cooking classes are my most popular of the year. I always teach them in April so that my students have some fun, healthful recipes to use for Cinco de Mayo (May 5th.) You know I am a sucker for themed family dinners on “holidays.” That and I just don’t enjoy taking the kids to crowded, greasy Mexican restaurants on one of the busiest and most inebriated nights of the year for something I can easily make at home. 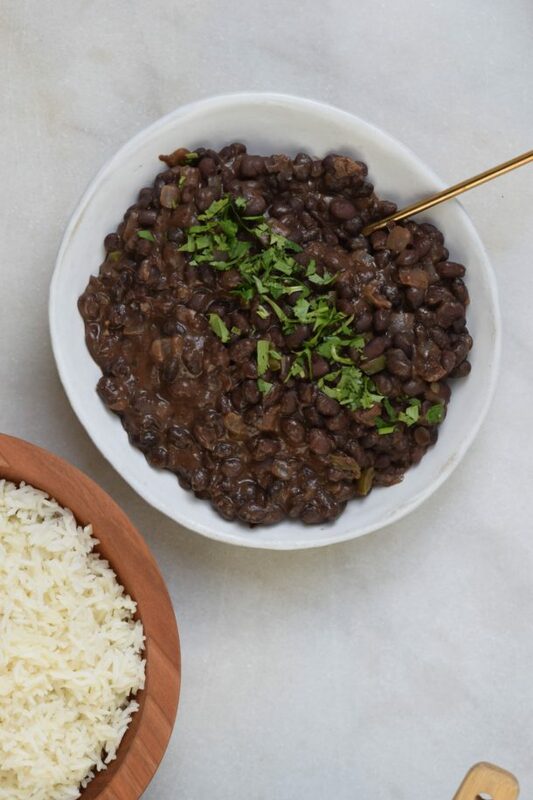 These versatile black beans are a staple in our house all year long. They’re close to Frijoles Refritos, meaning “well-cooked beans” (as opposed to “twice-cooked beans,” which is what I thought it meant for years.) But I’m not frying anything in lard or vegetable oil, instead cooking the beans with some onion, garlic, jalapeno and cilantro for great flavor. We eat them simply over rice, wrapped in a burrito, as a side with fajitas or tacos, or with huevos rancheros. Daughter #1 and her friends like to toast corn tortillas over the gas flame on the stove (they’re 14 years-old) and eat the beans like a dip. They are a must with any Mexican meal. The good news is that I can tell you how to easily make them from scratch (soaking dried beans) or from a can. Even though I avoid canned food like the plague, you have a great option with Eden Foods which does not use BPA in its can liners. Beans are an incredible source of low-fat protein and fiber, especially soluble fiber which has been shown to help lower cholesterol and stabilize blood sugar levels. 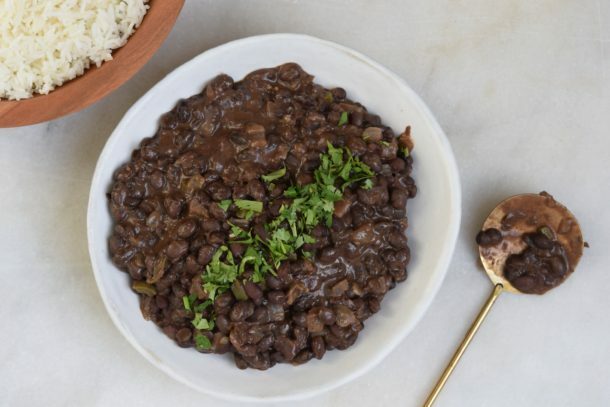 Black, red and pinto beans are crazy high in anti-oxidants, too. Another bonus is that they are rather inexpensive, especially if you buy them dried and cook them yourself. 1 pound of dried beans might cost you about $1.00. One pound dried equates to approximately 3 15-ounce cans of black beans at about $2.19 per can for Eden Organic in my natural foods store (other brands are much less, but you’re also getting that pesky BPA.) You can also buy the cans by the case from Amazon and save some money (12 cans for $16.60 at the time of this post.) Making beans from scratch is as easy as boiling water, but you need to plan at least 6 hours in advance to soak them and an hour and a half to cook them. Or just make a ton over the weekend and freeze them. Love that! Over the next week and a half, I’ll be posting some of my favorite Mexican-inspired dishes to wow your family and friends without letting your healthful eating take a siesta! Drain and rinse the beans, reserving the kombu. 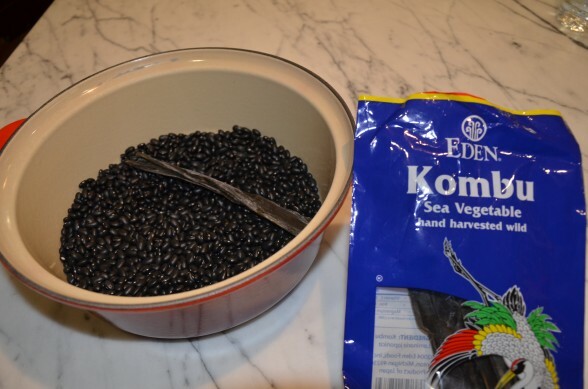 Place the beans and kombu in a large, heavy pot with enough water to cover by 3 inches. Bring to a boil over high heat, skimming the foam that rises to the top. Lower the heat to low and simmer gently, covered, for 1 hour. Heat the oil in a large, heavy-bottomed skillet over medium heat. Add the onion and garlic and sauté gently until tender, about 10 minutes. You can cover the skillet with a lid to soften the onions and garlic without allowing them to brown. Add the jalapeno and cook 1 minute, until tender. Remove the kombu from the beans and discard. Add the sautéed onion mixture, sea salt and cilantro to the beans and simmer uncovered for 30 minutes, or until very tender. Drain the beans and reserve 2 cups of cooking liquid. Pour 1 cup of liquid back into the beans and mash the beans with the back of a spoon until you have the desired consistency. Add more liquid, if necessary. Taste for seasoning and squeeze some fresh lime juice on top, if desired. Saute onion and garlic in olive oil in a medium saucepan until softened. Add jalapeno and cook for 1 minute. Add beans and liquid from the can (usually about ⅓ cup liquid per can) plus 2-3 teaspoons sea salt, 1 tablespoon chopped cilantro and simmer uncovered for 30 minutes. You can serve the beans as is or I like to mash them up a bit so they’re nice and creamy. Squeeze a little lime on top if you like. **Kombu is a sea vegetable which helps tenderize the beans and improves their digestibility. It is also rich in many vitamins and minerals. How would I make this using an Instant Pot? Thank you! Have you used an instant pot for beans before? It’s really easy! Check the manual for cook times based on whether your beans have been soaked or not. There’s about a 5 minute difference in cook time. I would not cook with the kombu though. Make sure there’s plenty of water to cover then beans but not too much because the beans will expand. Set the machine to the Beans setting or juct cook at manual high pressure for the time indicated in the manual (it’s about 30 minutes.) Do a quick release. I would take 2 cups of liquid out and drain the rest of the cooked beans and then start the onions in the instant pot on saute (just so you don’t have to dirty another pot.) Then proceed with the rest of the steps. What to do if you overcook your beans and the kombu dissolves. Help….. I was actually going to use the beans in the beat burgers. I think the recipe should still turn out fine! Do you store your kombu in the pantry sealed in the package it came in? Yes, but if you prefer to transfer it to a glass jar, feel free! How long will these last in the fridge? Can I freeze them? 4 days in the fridge and yes, they can be frozen. Pamela, should the beans be covered when soaking overnight on counter? Either way is fine. I don’t cover. Can the beans be made in a slow cooker? I just love your recipes and your meal planner. I study it before my weekly trip to the farmers market! Absolutely! Check my post for how to cook beans in a slow cooker and adapt. I would still saute the onions in a skillet. Much better flavor that way! I would also decrease the liquid by a smidge since there’s no evaporation in a slow cooker. Can I use this as taco filling? Sure! If you’re going to use the beans right away, perhaps use a little less liquid so it’s a little thicker. They do thicken as they sit. Enjoy! IS it okay to use these when making black bean tacos? Good gracious. I am wondering if you really meant to write 500. 500? Not 50? I think you’re better off buying already cooked black beans and starting from there. I haven’t been to Costco in a while, but perhaps they have huge quantities of cooked beans at a good price. Then just get some really big pots and an immersion blender! I am in the Philippines and need to do a replacement for refried beans. Since pinto beans are almost impossible to find here, this looks great. I will try it in the next day or two. Sadly, no jalapenos here. Also I will substitute bacon grease for the olive oil, because I prefer it – I make and smoke my own bacon. Limes are sometimes hard to find as well, but calamansi, while smaller … have a very similar flavor, so I will squeeze some of those. We will be doing smokey “pulled pork” (aka carnitas) tortillas, fresh salsa, and your black bean dip. Thanks for a great recipe you can do “from scratch” or can! I appreciate those sorts of recipes very much since many canned or named brand items may not be on the market shelf here. I loved reading your comment and wish I could come over and try your bacon — so impressed! I have a feeling your version of my recipe is going to be incredibly delicious! I know what you mean about not having certain canned goods at your disposal, but I can get everything where I am and much prefer to make from scratch. So much better for you and usually better tasting, too! I, too, did not have the kombu, however, we were making chicken enchiladas and had poached the chicken with onions, celery and peppercorns with a little salt and I used the leftover broth to boil the beans. I only had minor adjustments to the seasoning after that. Find the kombu in your local Asian market. The bigger the Asian market, the cheaper you will find it. Welcome, Abigail! I loved reading your comment :). Thank you for your enthusiasm. You’ve come to the right place! I just made this tonight and it is delicious. I added a little cumin during the last 30 minutes. I had it on top of plain rice and topped with lots of cilantro and fresh tomato. I would love a Mexican rice companion recipe. Do you have any suggestions? I usually eat the beans with rice that I make with a crushed clove of garlic, a pinch of salt and a pat of butter or oil. Otherwise I have recipes for red rice and a green rice that I’ll be posting after the new year. Too focused on holiday food right now!! I made these for dinner last night and they were excellent! Tonight I turned the leftovers into clayudas… healthy and so delicious. Thank you! These beans make great leftovers! I just had to look up what clayudas are — where have I been? My kids would looooove them. Thanks! 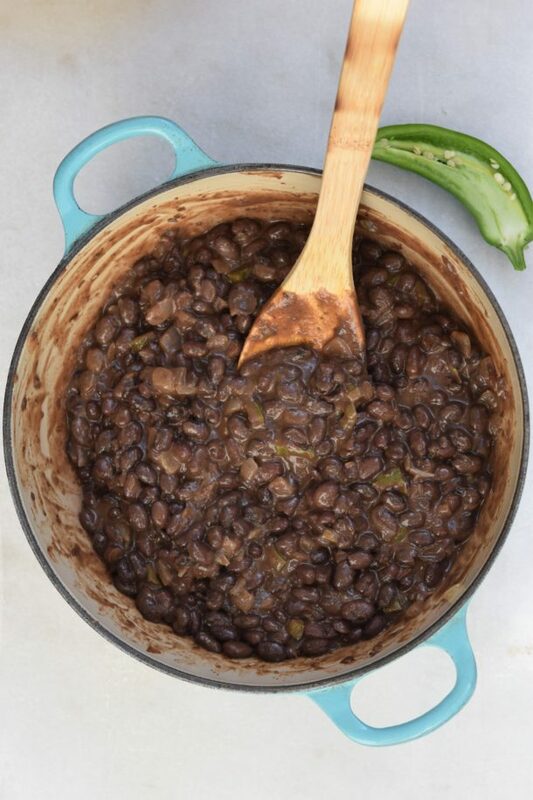 Great recipes, I plan to use them, until now when I want Mexican food I go to a Mexican restaurant, I guess now i will be able to eat at home Mexican food with this Mexican black bean recipe. Of course being Sicilian like my friend Lois M. I will now have to go to Sicily to get those red blood oranges to make my Red blood orange with spinach salad, lol. Welcome John! I love recreating my family’s favorite restaurant dishes at home. As for the blood oranges, we have PLENTY of them in Southern California!